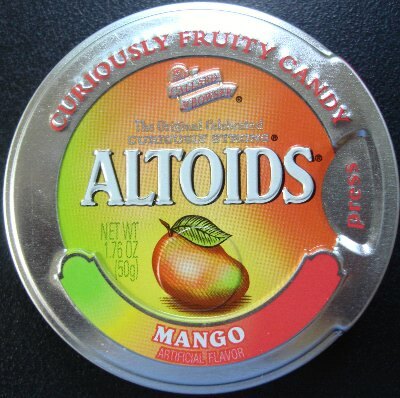 I don’t know about you, but when I think Altoids, I don’t think fruit. They’ve done a good job promoting themselves as a mint company. When I saw these I thought, aren’t they just making trouble for themselves by branching out? You do one thing well – why not stick to it? On the other hand, as I am sure I have mentioned a million times, I’m a sucker for mango. The idea of Curiously Strong Mango was something I couldn’t resist. These are little bumpy round things, kind of like little sugar flowers, in a pale orange color. They don’t look like mangoes, and I am not absolutely sure they taste like mangoes. It’s clearly an artificial flavor, at most one that tastes more like mango than it tastes like another fruit. They’re not like the mango Hi-Chew I reviewed recently, for instance, where you taste them and aren’t surprised to read in the ingredients that there’s real mango in there somehow. They are more “Curiously Fruity,” like it says on the tin, than they are in-your-face MANGO. My dad has a story that he loves to tell each Christmas. When he was a boy, he and his sister ran down the stairs on Christmas morning, rushed to their stockings and pulled outâ€¦ oranges? Yes, oranges. And that was in a good year. My dadâ€™s family considered this orange an exotic treat. My only comment on that? Good thing my mom was in charge of Christmas shopping when I was a kid. Of course, my dad also says he walked 10 miles uphill each way to school, so who knows what really happened on those long-ago Christmas mornings. 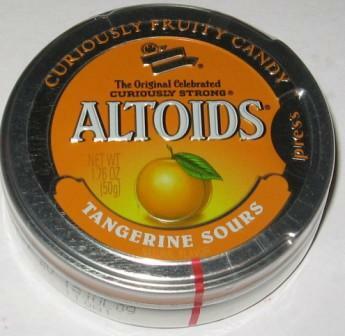 My dadâ€™s tale of Christmas oranges, though, along with the snow beginning to fall here in the Midwest, convinced me to try Altoidsâ€™ Tangerine Sours. 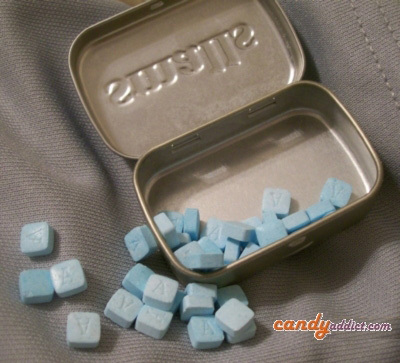 Iâ€™ve always appreciated the aggressive nature of Altoids. They simply arenâ€™t a wallflower candy. Instead, they are more like the uncle who has one too many at family gatherings and inevitably ends up dancing with his shirt off or passed out under a porch. These are mints you eat with anticipation. You know that there will be flavor, oh yes, and sometimes it may slightly overwhelm you with potency. But, like the expectation of a wacky uncleâ€™s trademark bad behavior, there is something comforting about the flavor and effectiveness of Altoids. After all, they consistently freshen even the most critically vile breath. 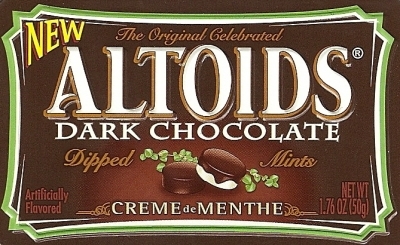 The new CrÃ¨me de Menthe and Dark Chocolate Dipped CrÃ¨me de Menthe are no exception. And Iâ€™ll say it right now: they are delicious. Altoids has a great website despite it being almost all Flash (which I hate for navigation). In their Flash game “The Great Flying Mintini” you must control the angle and power of Mintini being shot out of a cannon. 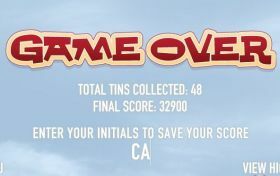 Try to grab Altoids tins while flying through the air and you MUST land in the marked landing area. It’s tricky but very fun. Above you see my score the first time I tried it and didn’t know what I was doing. See if you can beat it!